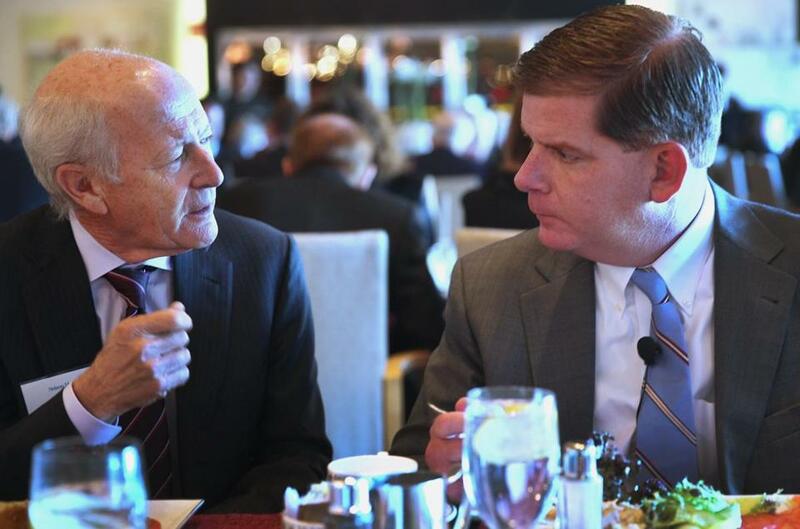 Robert Epstein of The Abbey Group, left, spoke with Mayor-elect Martin J. Walsh during a luncheon meeting at the Meritage Restaurant in the Boston Harbor Hotel. Mayor-elect Martin J. Walsh is backpedaling from one of his most prominent campaign promises, telling business leaders Thursday that he is in no hurry to restructure the powerful city agency that has approved a burst of development in recent years. During his campaign for mayor, Walsh said the Boston Redevelopment Authority needed an urgent overhaul, pledging to “in early 2014” replace it with a new economic development entity that would be more transparent and responsive to residents and businesses. But he acknowledged Thursday that the proposal rankled many developers and business leaders, and he sought to reassure them that any changes would not disrupt the building boom that is transforming much of the city’s downtown and outlying neighborhoods. Throughout his remarks at the Boston Harbor Hotel, Walsh adopted the posture of an incoming mayor who is still trying to find his footing, instead of the confident candidate who months earlier had articulated a 14-point plan that would overhaul the BRA while spurring economic growth. The mayor-elect, who will take office Jan. 6, said he still intends to make adjustments to the BRA’s operations, but he noted that any major changes to its structure will not occur for several months. For example, he said the agency will continue to hold regular meetings early in 2014 to decide on projects now under review. “There are proposals in the pipeline and I want to continue moving them through,” he said. Walsh’s step back from dismantling the agency prompted relief from real estate executives who had fretted such action would halt one of the most significant periods of building activity in recent history. More than 5,000 homes are under construction across Boston, and offices and hotels are under construction from the South Boston Innovation District to the Fenway and Roxbury. Not everyone agrees. Some observers have sharply criticized the agency, saying its review process is too often removed from the input of ordinary residents and favors select developers. And activists had been counting on Walsh to end what many see as a fundamental conflict between the BRA’s dual functions of community planning and economic development. They had asserted that the financial interests of developers are too often allowed to steamroll the concerns of neighbors. “I don’t see any reason why planning shouldn’t be separated on Jan. 7th,” said Jim Zahka, a West End resident who is on a panel reviewing a massive development proposed for the TD Garden area. The Menino administration on Thursday granted $7.8 million in tax breaks to help that project move forward, a move Zahka criticized as an unnecessary giveaway. The BRA has been in charge of reviewing all major developments in Boston since 1957. It was created with a mandate to reverse the urban decay that once infected swaths of the city. As the former head of a major building trades union, Walsh shares an interest with business and real estate executives in accelerating building activity, as it provides jobs for thousands of construction workers. In recent years, he has repeatedly appeared before the BRA to speak favorably on behalf of large development proposals. Even though Walsh stepped back from his commitment to immediately overhaul the BRA, Zahka held out hope that change would eventually occur in a Walsh administration. “If Mayor-elect Walsh is willing to significantly beef up the BRA’s planning, and give it some independence, I think that would be outstanding,” he said. During the campaign, Walsh pledged to do exactly that. He said he would create separate offices for planning and development under a new entity to be called the Boston Economic Development Authority. Under his 14-point plan, that agency would replace the BRA and be helmed by a new director with greater independence from the mayor’s office. The agency’s current director serves at the pleasure of the mayor. Walsh even proposed to give the City Council oversight of the new agency’s finances, which would have relinquished a significant amount of his power over development. Walsh emphasized the need to attract new businesses to Boston and create a more predictable process for reviewing building proposals. He also noted that development activity in the city generates millions of dollars in annual tax receipts — providing funds for other new initiatives he promised during the campaign.